EvaGreen® dye is used in all of Biotium’s dye-based qPCR master mixes, which combine superior brightness and sensitivity, with the ability to do sensitive melt curve analysis in the same reaction. See EvaGreen® Dye Technology to learn more. EvaGreen® dye is non-toxic, non-mutagenic, and not hazardous to aquatic life. * Practicing HRM may require a license from Idaho Technologies, Inc. Figure 1. EvaGreen® dye binds to dsDNA via a “release-on-demand” mechanism. Figure 2. EvaGreen® is non-toxic, non mutagenic and non hazardous to aquatic life. 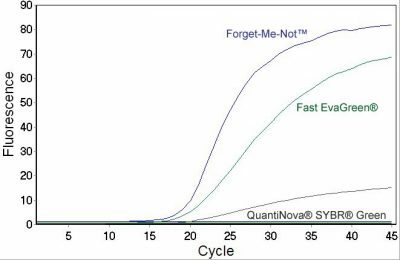 Forget-Me-Not™ qPCR Master Mix is a hot-start EvaGreen® dye-based master mix for use in real time PCR applications and DNA melt curve analysis. Forget-Me-Not™ features a unique combination of a master mix containing a low concentration of blue dye, plus a DNA template buffer containing a higher concentration of blue dye. When you add the 2X Forget-Me-Not™ Master Mix to your reaction, it appears light blue. Then, when you add template containing Forget-Me-Not™ Template Buffer to the reaction, the color turns dark blue (Figure 1, right). Forget-Me-Not™ allows you to see at a glance whether you forgot to add master mix or template to any of your reactions, so you can catch pipetting mistakes and avoid wasting time, reagents, and your precious DNA samples. To learn more about our master mixes, please see Forget-Me-Not™ Master Mix Technology. Figure 3. A comparison of the raw fluorescence signal from qPCR reactions performed with two EvaGreen® master mixes (Forget-Me-Not™ EvaGreen® and Fast EvaGreen®) and QuantiNova SYBR® Green. EvaGreen® dye is less inhibitory than SYBR® green, allowing for a much brighter signal. Forget-Me-Not™ Universal Probe qPCR Master Mix is a high-performance product for fluorescent probe-based PCR applications, including quantitation and SNP genotyping. This kit is suitable for all fluorescent probe-based technologies, including hydrolysis probes (such as TaqMan® and dual-labeled BHQ® probes) and displacement probes (like Molecular Beacons). Forget-Me-Not™ Universal Probe Master Mix shows excellent concordance of results in singleplex and multiplex reactions, has broad instrument compatibility, and can be used in both standard and fast protocols. A separate kit is also available with ROX, if your instrument requires ROX reference dye. Figure 4. 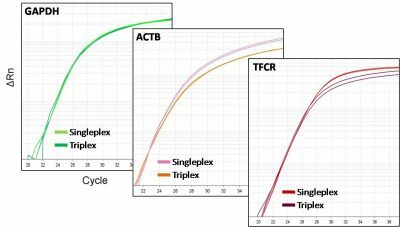 Forget-Me-Not Universal Probe qPCR Master Mix works exceptionally well for mutiplexed probe PCR reactions. Forget-Me-Not™ qPCR Master Mix 31041 EvaGreen dye-based master mix with a unique two-color system for tracking which reagents you’ve added to your reaction. Forget-Me-Not™ qPCR Master Mix with ROX 31042 EvaGreen dye-based master mix with a unique two-color system for tracking which reagents you’ve added to your reaction, with ROX reference dye. Forget-Me-Not™ Universal Probe qPCR Master Mix 31043 High-performance master mix for fluorescent probe-based PCR applications, including quantitation and SNP genotyping. Forget-Me-Not™ Universal Probe qPCR Master Mix with ROX 31044 High-performance master mix for fluorescent probe-based PCR applications, including quantitation and SNP genotyping. With ROX reference dye. Cheetah™ Taq is a chemically-modified hot-start DNA polymerase. 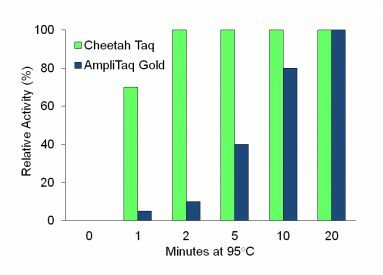 Using a proprietary method developed at Biotium, Cheetah™ Taq is modified to have absolutely no activity at room temperature, but be completely activated after two minutes at 95°C. Takes less than 2 minutes to activate, much faster than AmpliTaq Gold and HotStarTaq®. Better recoveries of both 5′-3′-polymerase and 5′-exonuclease activities following activation than AmpliTaq Gold. Better stability than AmpliTaq Gold during storage. Can be activated at alkaline pH (8.5-9) for optimal Taq activity and more specific target amplification. Figure 5. Cheetah™ Taq recovers full activity faster than other hot-start enzymes such as AmpliTaq Gold. EvaEZ™ Fluorometric Polymerase Activity Assay Kit provides an easy and accurate way to determine the activity of a nucleic acid polymerase without using radioisotopes. It contains EvaGreen® dye together with a primed template, dNTPs, and MgCl2 in a Tris buffer system. In the presence of DNA polymerase activity, the primer will be extended to form a double stranded product that can bind EvaGreen® dye, resulting in an increase of fluorescence. The rate of increase of fluorescence is positively correlated to the activity of polymerase. The assay was developed for the measurement of Taq DNA polymerase activity. It can also be used for other DNA polymerases such as Pfu, Vent, Phusion®, Bst, Phi29, MMLV, AMV, SuperScript®, T4 DNA polymerase, T7 DNA polymerase, Klenow, and E. coli DNA polymerase I. The activity assay can be conducted at temperatures from 4°C to 75°C. Figure 6. Sample data from an EvaEZ assays, showing a titration of Taq DNA Polymerase. Biotium is proud to have developed the cutting-edge technology of viability PCR, a technique in which cell viability can be assessed by treating a sample with a DNA-binding dye, followed by a qPCR or isothermal amplification reaction. To learn more about this technology and our portfolio of reagents for viability PCR, please see Viability PCR Technology.